Butterworth Charity, London England. 1976. St Bartholemew the Great church, Good Friday. The Rev'd Dr Newell Walbank. Joshua Whitehead Butterworth was a member of a city firm of law publishers, and was perpetuating a charity dole that had been in existance for many years. In 1887 the dividend from his endowment and other charitable doles was divided into 21 equal shares, and was placed on a flat tombstone in the churchyard, from which deserving and selected widows collected their Easter dole under the supervision of one of the churchwardens or a sidesman. No distribution of buns to children was made but each of the widows receives one or more buns. During the nineteenth century the sum distributed varied from year to year, but was ussually somewhere between two shillings and sixpence and four shillings. Nowadays the choir and congregation meet for the traditional Easter service outside. 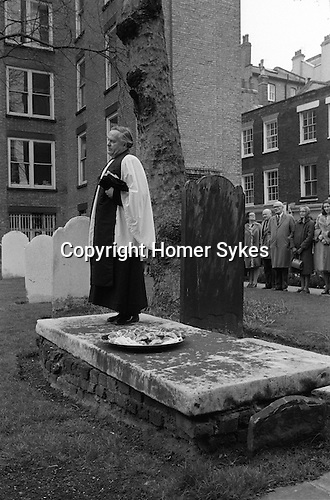 The Rector preaches from the large flat tombstone in the centre of the churchyard, where once the widows collected their Easter dole. A silver plate contains hot cross buns. He enquires if there are any poor deserving windows in the congregation? Easter hymns are sung and afterwards hot cross buns are distributed to all present.